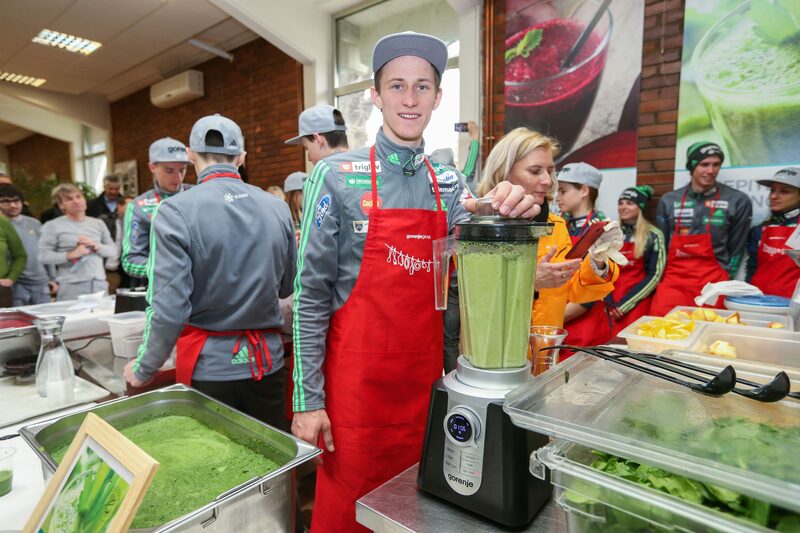 After a fantastic season in which he whipped the competition and in a single season won every ski jumping title there is, leaving his fans worldwide ecstatic, Peter Prevc and the Nordic ski team paid a visit to Gorenje and its employees today to whip up some wholesome colourful smoothies for them. As a token of appreciation for over twenty years of loyal support to the athletes, Prevc presented Gorenje with his jersey from the final competition in Planica. 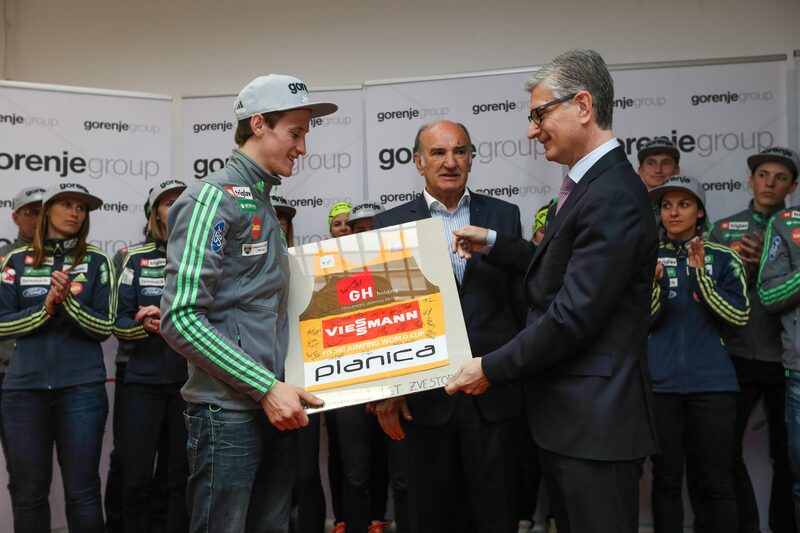 Slovenian ski jumpers rounded off a magnificent record-breaking season with the great Crystal Globe for Peter Prevc. 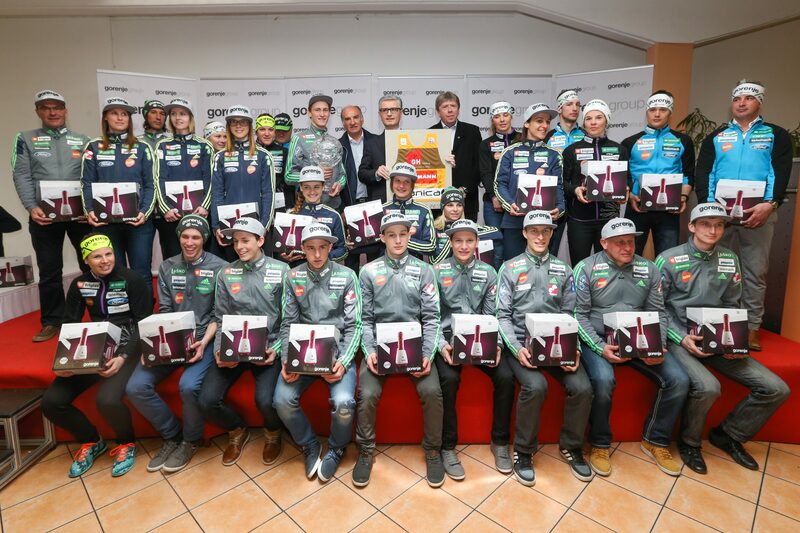 Gorenje, the proud general sponsor of Slovenian Nordic ski team for 23 years, also thanked Prevc, our eagles, their support team, and the entire Nordic ski team for the historic achievement that set new standards in ski jumping. In a pleasant gathering in Gorenje's cafeteria our aces took on a different role. 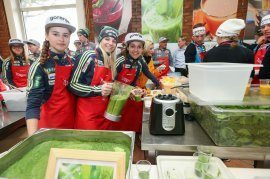 They tried out Gorenje's popular power blenders and made some funky smoothies which they then shared with the employees. They were congratulated time and again – both for their success in sports and for the delicious smoothies. Gorenje's employees also had the rare opportunity to get up close and personal with the great Crystal Globe, the most coveted award in ski jumping. To thank Gorenje for more than twenty years of support as the general sponsor of the Nordic ski team, the team of ski jumpers (men and women), cross country skiers, and Nordic combined athletes presented the company with a priceless present: Peter Prevc's jersey from this year's final competition in Planica when he was crowned champion of the season and set the record for both points in overall standings and number of wins in a season. "We are very grateful and happy to visit Gorenje and see how many faces we cheer up. We are glad to share our beautiful emotions. In am sure there are still many to come," said Peter Prevc. "We thank Gorenje for making it possible for us to do what we love the most and bring happiness to the crowds. Without such support, our achievements would not have been possible," added cross country skier Vesna Fabjan. Ljubo Jasnič, chairman of the ski jumping and Nordic combined section, pointed out that Gorenje's employees also did a fantastic job as fans at the competitions. Peter Prevc and the Nordic team were congratulated for their awards and medals by Gorenje President and CEO Franjo Bobinac who stressed that Gorenje will continue to support them on their way to further success. "To win amidst such harsh competition, one has to constantly change and improve year in, year out. Change and hard work are the only constant aspects – besides the logo you wear on your head wear. That constant, called Gorenje, is always with you and remains with you. On behalf of the 10,000-member family of Gorenje, I thank you for your success, wins, and memorable experiences." 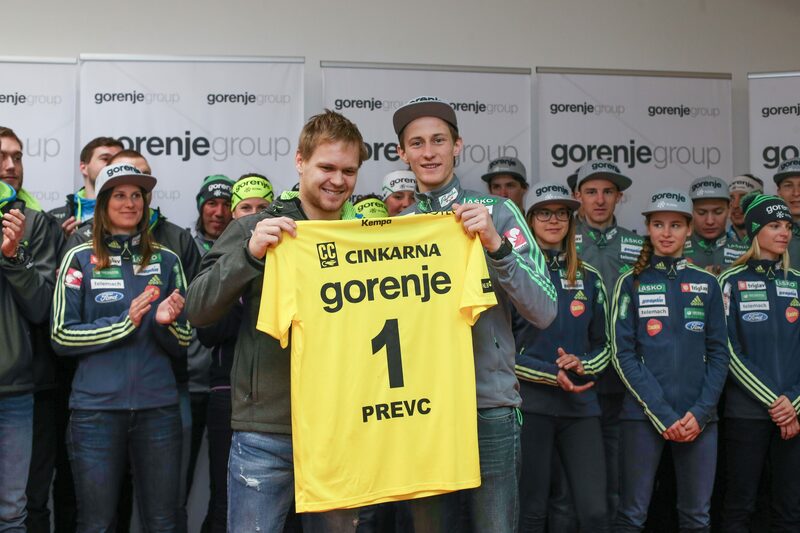 The Nordic team was also congratulated by team handball players of RK Gorenje Velenje who presented Peter Prevc their jersey with number 1 and his name. · record number of wins in a season (15 wins, 22 podium finishes).